The Nomad Integrator shell jacket is a 100% waterproof shell that will keep you warm, dry and out in the field. This one shown is the Kryptek Banshee camo pattern. You can’t kill big bucks or elk when you’re on the couch, so don’t let rain or weather keep you from getting into the field. The best way to do this is to have great rain gear and the Nomad Integrator Shell Jacket is a piece of rain gear that will keep you dry and out in the field. This 100% waterproof shell will keep you on the stand and in the field from the early to late seasons so that you won’t miss your shot on your next trophy. 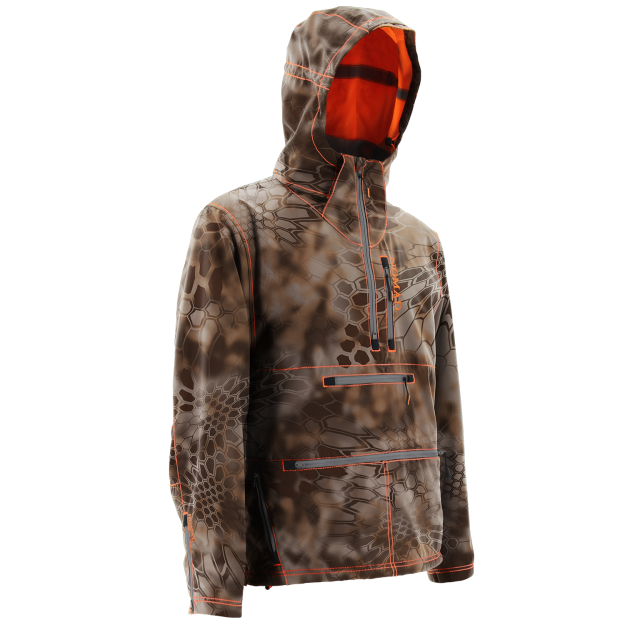 The Integrator shell rain jacket is available in Kryptek Banshee camo and Mossy Oak Break Up Country camo patterns. 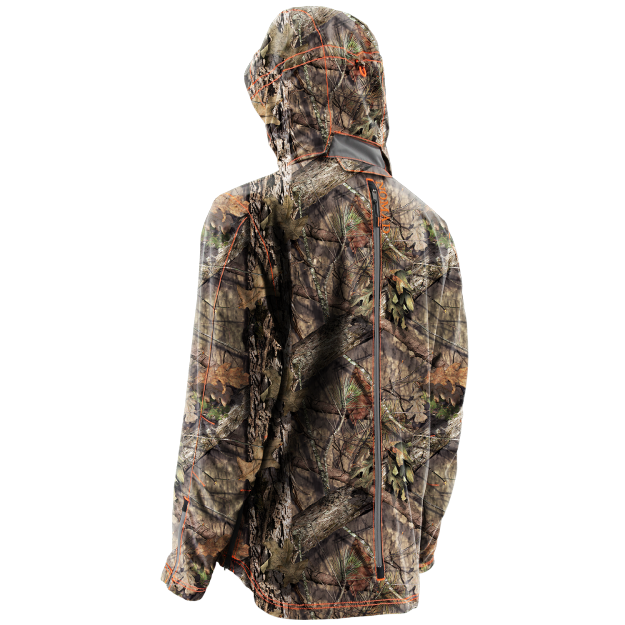 The Mossy Oak is shown here with the zippers on the back that expand the jacket to add layers. Having a waterproof shell is important to any hunter. The Nomad Integrator shell jacket will keep all water out and will keep you dry and warm while staying protected from the elements. The jacket is very well made and features a large pocket in the front and side zips for main entry. Space is not limited with the Nomad Integrator. There is plenty of space for your gear in the pockets and you can keep your hands warm. There is a rear zipper port for putting your safety harness on while tree stand hunting and another zipper to expand the jacket for when you need to add layers in cold weather. We’ll spare you the details of the technical features of the jacket, but know this. It works by wicking away the moisture on your body to keep you dry and keeping the water out. This way your sweat won’t chill you and you’ll stay dry whether you’re stalking or sitting. Don’t miss your chance to check out this 100% waterproof shell jacket from Nomad. You won’t be disappointed in the Kryptek Banshee pattern and you can also own it in the Mossy Oak Break Up Country. The jacket can be purchased on the Nomad website here for $169.99. Don’t miss more of the latest hunting gear reviews on MorningMoss.